My new role at work is turning me into one of those people who need to schedule meetings in 15 minute increments. Some of this is due to absorbing a lot of new groups and responsibilities all at once. In the short term, it will be long days. Things should ease up eventually. Last night I left the office a little later than I wanted. By the time I got home it was too late for a run or a workout. I worked from home today and that saved me approximately three hours of total commuting time. I started working at 5:00 AM and took a break around 8:00 to do my run. It was 63 degrees outside but it felt cold in my house. I probably should have gone with short sleeves, but I went with long sleeves on top and shorts on the bottom. It's what I call a runner's mullet. Halfway through my run I renamed it the "runner's bad decision" because the low clouds had given way to sunny skies and I was heating up fast. My distance target was modest and I knew my run would be short enough to bear the heat. About 2/3rds through my run, my cell phone rang. It was my office and I had to think about whether I'd cop to running when I answered it. Luckily it took so long to fish my phone out of my SPIbelt that the call went to voicemail. On the bright side, that short break cooled me down nicely. The fact that someone was waiting for me to respond motivated me to pick up my speed. I covered the last mile much faster than the previous two and I was back home and on the phone in 10 minutes. I'm glad I had the opportunity get my run in today. Next week will very tight and I'll need to go into the office on Friday. Monday is a holiday so I'll get to string four runs in a row. That's good because, after Monday, I'll probably go run-less until next Saturday. I love the mullet (clothes, not hair. I can already hear you bragging about the hair mullet you sported thoughout high school and college). 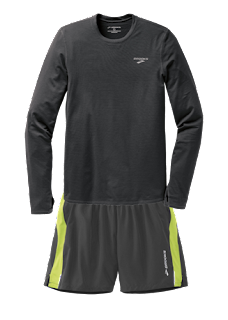 You know there are many sites dedicated to advice on what to wear while running in specific temperatures? They're very helpful. I would paste a link, but I think it's important for you to do the search on your own. Part of the process, if you will. I never ever had a mullet because it's a hairstyle that actually subtracts IQ points. I am a big fan of the runner's mullet because I tend to get colder above the waist on chilly days. I've looked at some of those sites that tell you how to dress when you run. Since none of them suggest shorts over running tights, I've dismissed them as inaccurate and unhelpful.